A great fix for eager gardeners in the north! Total Spring Fever here in Chicago-land! A week of unseasonably warm temps in the 70s and 80s has my spirits soaring. Good Friday off work helped too, with a frenzy of garden clean-up and the sore muscles to prove it! I also found a great way to have my “too-early cake and eat it too,” if you will. Home Depot is selling cute containers planted with early-spring-blooming perennials, just ready for instant gratification. My $25 dollar fix includes columbine, forget-me-not, pansies, coral bells and more. 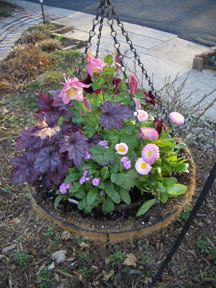 It easily popped into a hanging basket near my front path and should withstand April’s freezes. 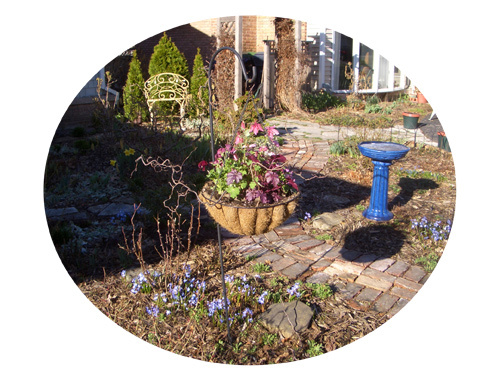 Then it can be replaced with summer-blooming annuals and planted in-ground. This and a budding rhododendron on the front stoop have chased away the stale winter dregs and perked up my curb appeal. Come what may, I am ready for Spring!